HSCT Is a Controversial MS Therapy. Would You Have It? I’ve Decided! There is little doubt that HSCT is controversial as a treatment, and some even say a cure, for multiple sclerosis. Some talk of great benefits; others feel the risks involved are too high. Then again, if you look at the side effects listed for the various disease modifying therapies (DMTs), they can be frightening, with death sometimes being one of them. It’s all a matter of weighing the anticipated benefits against the risks that may possibly affect you. And, above all, having considered everything, every fact available, you have to remember that the ultimate decision is yours — and yours alone. Last week, on Multiple Sclerosis News Today’s Facebook page, I let my position be known. I have done my research, I have talked to many patients with different forms of MS who have undergone the treatment, and I have talked with one of the world’s leading doctors who perform the treatment. In short, I have made my decision. If medically suitable for it, I am going to put myself forward to have HSCT – autologous hematopoietic stem cell transplant. This is a procedure where a patient’s own healthy stem cells are harvested, then chemotherapy suppresses the faulty immune system. Finally, the healthy cells are reintroduced to build an immune system that does not have MS. So, on Sunday, Oct. 9, I’ll be flying to Moscow’s A.A. Maximov Center to undergo four days of testing and medical assessment to determine if I am a suitable candidate for the therapy. Of course, there is no guarantee that I will be, but even if not, I’ll be armed with the results of an amazing series of medical tests that, other patients have told me, can reveal other problems that can now be treated. 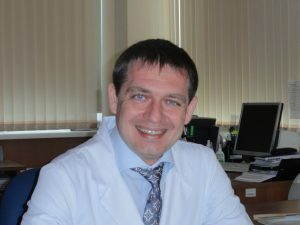 I interviewed Dr. Denis Fedorenko, who leads the HSCT therapy team in Moscow, which resulted in me writing three columns here. And it was during our second conversation that I asked whether my irregular heartbeat (atrial fibrillation) would rule me out as a patient. To my amazement he said it was “not, by itself, a contraindication,” but that I’d need to go to Moscow for a thorough assessment. And that is what is happening in October. My HSCT journey – some may call it an adventure – starts then. Hopefully, it won’t end then as well. What of the risks? From everyone I have spoken to who has had HSCT, from research involving hundreds of cases, and from the opinions of many (though not all) within the medical profession, I have absolutely no doubt that the possible benefits far outweigh the possible risks. Conversely, I have never had any form of DMT and, quite honestly, the possible, albeit rare, side effects are just too much to face. This article was written by me and first appeared in MultipleSclerosisNewsToday.com. Why haven’t you tried any of the DMT’s, easy stuff, first? I have with out much success Every time I broach stem cell, they say it’s too dangerous and not proven to be effective Please let us know how it works. I hope pray that it works for you. I would love to see a bit of Russia. Good luck. Hi Sue, I am not so sure DMTs are the ‘easy stuff’. Some pharma manufacturers include death in the list of their drugs’ rare side-effects; one even refers to death as a ‘fatal incident’. All the digging I have done has led me to the opinion that HSCT is much safer than DMTs. But, of course, that is a personal opinion and, although it is shared by many, others have a different view. At this stage, I am only going for a four-day medical assessment, to determine whether or not I am suitable for HSCT. You never have taken any ms drugs? How long do you have the disease? Hi Luis, I was diagnosed April 2002. No, never any MS drugs, just some to deal with frequency and urgency of urination, constipation and pain. I do take drugs for epilepsy and my heart condition. This is awesome news. I am thrilled that you are taking a chance and praying for you qualify. As you already know Dr Fedorenko rocks as does Anastasia and the whole crew. You will be in good hands….. Yeah!!!!!!!! Hi Mary, yes, you are right about Dr F and Anastasia. I read about Heidelberg performing HSCT too. Did you investigate there too ? No, to be honest, I have not looked into that. Good luck Ian! I wish you well! I think the hardest part of all of this is actually deciding to go ahead with the therapy! I am heading over in early November too. Love reading your blog.